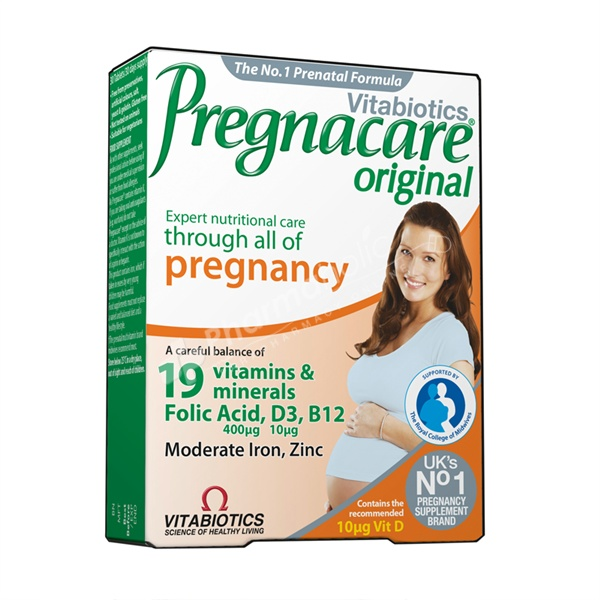 Pregnacare Original is the most popular and trusted prenatal supplement by mums to safeguard the diet of those who are planning for pregnancy or are already pregnant. Pregnacare contains a comprehensive formula to help safeguard all round health and vitality, as well as important nutrients for pregnancy. Folic acid contributes to maternal tissue growth during pregnancy. The unique formula also includes zinc which contributes to normal reproductive health. Maltodextrin, Magnesium Oxide, Microcrystalline Cellulose, Vitamin C (Ascorbic Acid, Hydroxypropylmethylcellulose), Ferrous Fumarate, Zinc Sulphate, Tablet Coating (Hydroxypropylmethylcellulose, Hydroxypropylcellulose, Natural Source Colours [Titanium Dioxide, Iron Oxides]), Anti-Caking Agents: Silicon Dioxide, Stearic Acid and Magnesium Stearate, Niacin (as Nicotinamide), Vitamin B6 (Pyrodixine HCI), Natural Mixed Carotenoids (Betacarotene, Modified Starch, Corn Starch, Glucose Syrup, Antioxidants: DL-Alpha Tocopherol, Sodium Ascorbate), Pantothenic Acid (as Calcium Salt), Vitamin B12 (Cyanocobalamin, [Carriers: Maltodextrin, Trisodium Citrate, Citric Acid]), Vitamin E (D Alpha Tocopheryl Acid Succinate) (from Soya), Vitamin D3 (Cholecalciferol [Carriers: Acacia, Sucrose, Corn Starch, Medium Chain Triglycerides, Antioxidant: DL-Alpha Tocopherol]), Thiamin (Vitamin B1 as Mononitrate), Riboflavin, Copper Sulphate, Vitamin K (Vitamin K1, Acacia, Sucrose), Folic Acid (as Pteroylmonoglutamic Acid), Potassium Iodide, Biotin, Sodium Selenate.